Featuring advanced aerodynamic design measures such as Flow Acceleration Channels and Noctua’s AAO frame, the NF-A12x15 is a highly optimised, premium quality quiet fan in size 120x15mm. Its 15mm slim design makes the NF-A12x15 ideal for space-restricted applications such as low-profile CPU coolers or HTPC cases. The FLX version provides 1850/1400/950rpm speed settings via the supplied Low-Noise Adaptors in order to allow full flexibility in fine-tuning the fan for maximum ventilation performance or near-silent operation. Its superb running smoothness, reference-class SSO2 bearing and Noctua’s trusted premium quality make it an elite choice for the highest demands. Having a thickness of only 15mm, the NF-A12x15 is much slimmer than standard 120x25mm fans. This makes it ideal for typical slim fan applications such as low-profile CPU coolers as well as for freeing up space by replacing standard 120x25mm fans on tower coolers, radiators or in PC cases. With many larger-diameter slim fan designs, the shorter axis and bearing lead to a reduced running stability and lifespan. The NF-A12x15 uses a metal-reinforced motor hub, a measure typically found in high-speed industrial fans, in order to guarantee Noctua’s signature stability and longevity. The NF-A12x15 impeller features suction side Flow Acceleration Channels. By speeding up the airflow at the crucial outer blade regions, this measure reduces suction side flow separation and thus leads to better efficiency and lower vortex noise. Providing 1850, 1400 and 950 rpm speed settings via the supplied Low-Noise and Ultra-Low-Noise Adapters, the NF-A12x15 FLX (Flexibility) can be fine-tuned for superior airflow or maximum quietness. The NF-A12x15 features the further optimised second generation of Noctua's renowned, time-tested SSO bearing. With SSO2, the rear magnet is placed closer to the axis to provide even better stabilisation, precision and durability. Noctua fans are renowned for their impeccable quality and outstanding longevity. Like all Noctua fans, the NF-A12x15 features an MTTF of more than 150.000 hours rating and comes with a full 6-year manufacturer’s warranty. The Noctua NF-A12x15 is a fine fan, never mind that it is also a slim fan. They used airflow-enhancing features, close tolerances and a good rigid frame so that it would not warp – supporting those close tolerances. Noctua has gone all-out to make this a great fan. They have also included a number of accessories so there is little or nothing left to buy. By including a LNA, they are in essence giving you a second fan. And the FLX having a UNLA, it’s like getting a third fan. When you look at the price, you are getting a great deal in a slim fan. Noctua ha lanzado una nueva colección de productos de gama alta para el apartado de refrigeración que, como siempre, dejan a la marca en excelente lugar. Por un lado, tenemos los ventiladores Noctua NF-A12x15, una excelente alternativa para disipadores slim o chasis compactos donde no tengan cabida los tradicionales de 25 mm de grosor. Los NF-A20 son una opción para chasis que permitan los modelos de 200 mm, aunque no ofrecen una gran mejora frente a modelos de 120 mm. Mientras, los NF-A4x20 son un sustituto ideal para dispositivos ultracompactos, ya sea por reparación o para mejorar su sonoridad. Por si fuera poco, todos ellos ofrecen nada menos que 6 años de garantía, por lo que tenemos ventiladores para rato. Además, Noctua siempre busca suplir todas las necesidades de sus clientes y para ello lanza algunos accesorios como los que hemos visto, los se unen a un inmenso portafolio que podemos consultar aquí. It is clear as soon as you get your hands on the packaging that this latest line of Noctua cooling fans exude quality. For many people, the trademark colour scheme will always be a love/hate relationship but there's no denying that it has become synonymous with the Austrian manufacturers premium products. These new A-Series additions are no exception and shift decent volumes of air whilst performing very well acoustically. The fact that their quiet performance can be lowered even further using the supplied LNA (and ULNA in the case of the FLX NF-A12x15) is a bonus. We would imagine that the majority of buyers considering the slim 120mm model are going to be looking to implement one or two in an HTPC environment, or perhaps as a push/pull combination in a smaller form factor chassis. The 200mm NF-A20 is a little different in that it is arguably an even more niche model - in the age of downsizing how many people still own a case capable of housing such a hefty blower. On the other hand Noctua should be applauded for now offering their premium, and exceptionally quiet cooling solutions, in almost every conceivable frame size. Dans un boitier tel que les HTPC, 10 mm de gain de place peuvent faire la différence et quant on voit que le ventilateur reste performant c’est tutti bueno ! Nous retrouvons les optimisations aérodynamiques propres à la série NF-A des ventilateurs Noctua garantissant ainsi un bon contrôle du flux d’air. La marque autrichienne assure aussi la fiabilité de son NF-A12x15 dans le temps en incluant un moyeu renforcé en métal. Du coup la garantie est toujours portée à 6 ans. La petite fenêtre ronde permettant de bien montrer cette partie métallique est quelque peu discutable d’un point de vue esthétique… Mais cela se saurait si c’était le principal argument de Noctua… Le bundle est toujours aussi conséquent avec deux types de fixations et surtout plusieurs type de câbles. Noctua nous livre tout ce qu'il sait faire de mieux dans le secteur, c'est-à-dire un ventilateur efficace et sacrément moche. Les couleurs de la marque ne feront pas l'unanimité à l'heure ou le RGB occupe la scène hardware depuis quelques mois déjà. Si l'on fait abstraction de cela, le NF-A12x15 a tout pour plaire. Sa conception est soignée, son bundle est riche, ses performances sont très bonnes et les nuisances sonores bien maîtrisées pour un modèle tournant à près de 2000 tr/min. 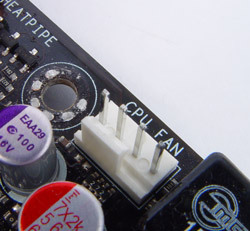 Le faible encombrement permet de remplacer un ventilateur trop épais pour être placé sur le socket d'une plateforme LGA 2011 par exemple. Il peut aussi prendre place dans un boîtier réduit, sur un ventirad top flow pour gagner 10 mm en hauteur. We have no doubt about the top quality of Noctua products. Each one of them is well designed. Even the package is exceptional. Most manufacturers are missing these little things that count while Noctua provides package with everything you may need for installation. Long years of designing and engeneering gave great results. Where you could think there can’t be done much more, Noctua proved that even the best products can be improved. New A series fans are the best in their class and it’s hard to find anything similar on the market. Even though new fans are considered as “slim”, they provide top air pressure while keeping low level of generated noise. Perfect balance for all who expect the best from their fans. Ventilátor (NF-A20) je naozaj "obrovský" a neskutočne kvalitne spracovaný. Keď ho chytíte do ruky, okamžite mu prepáčite jeho cenu 29.99 eur. Konštrukcia, príslušenstvo - všetko kričí na Vás top kvalitou. Na ventilátor som pozeral zopár minút než som sa vôbec dostal k testu. Veliki NF-A20 i u PWM i U FLX verziji košta oko 33 € što je korektna cijena za veličinu ventilatora, svu opremu koju donosi i na kraju krajeva vrlo dobre performanse uz ne previsoku buku. Kvaliteta izrade je visoka, materijali odlični a tehnologije jamče dugovječnost – kao i šest godišnje jamstvo uostalom. NF-A12x15 su po cijeni od 24 € pogodni za ugradnju u skučenija HTPC kućišta i na manje hladnjake, a obavezno ih se treba malo usporiti jer su na visokim okretajima čujniji. “Propuh” koji stvaraju je vrlo dobar i na nižim okretajima. A4x20 je u svim verzijama oko 20 €. Visoka je to cijena za 40-milimetarske ventilatore, no zbog kvalitete izrade, jamstva i ponajprije velike kompatibilnosti i mogućnosti prilagodbe isplati se platiti i tako visoki iznos. Ventilatori jesu bučniji pri visokim okretajima, no za kakav komad mrežne opreme koji je u ormaru to i nije bitno, a koncentrirana je zračna struja visoka i moćna. NA-SAV3 i SAV4 su po 11.50 € za što kupac dobiva kvalitetu, kompatibilnost s velikim brojem ventilatora i 16 komada nosača za po četiri ventilatora. NA-FC1 je svestran i kvalitetan kontroler za do tri ventilatora koji je moguće napajati direktno iz SATA Power konektora, pa može kontrolirati i jače ventilatore, no nije jeftin – 15 €. I za kraj, NA-SAC5 adapter koji može biti iznimno koristan za jače ventilatore koji se direktno napajaju iz SATA Power konektora i tako ne opterećuju ploču. Negativna je jedino cijena od oko 8 €. Jumping right into things and as you would expect from Noctua, the performance of these products is second to none. Given their respective sizes, all of these fans create a decent amount of airflow when tested in an open world environment, i.e. not in a case but just on a table. As mentioned I have actually used the NF-A4x20’s on a 3D printer in the past and was a great upgrade from the cheap fans that it had originally come with. While some may criticize the colour scheme, I don’t recall hearing very many people talk ill of the performance of any Noctua product. These fans all offer a great amount of airflow, again, for their respective sizes and remain as quiet as possible when doing so. The massive NF-A20’s are for those who need the most airflow possible but do make sure your case or where ever you are using them can cater to their 20cm sizes. The A4x20’s and A12x15’s are for when space is crucial and you need the most from your fans. The small 20mm and their unique size can come in handy for a number of scenarios. The added airflow to say the intake vents on a lot of the newer PC gaming cases is sure to help keep your components as cool as can be. The A12x15 are slimline and will surely come in handy for those looking to go with a push/pull configuration on any radiators for CPU and GPU cooling. Too many times have I seen a case where you can’t install a push/pull configuration due to space restrictions, well no more! Noctua’s A12x15 are sure to help you overcome this issue with ease. All of these fans in their own rights are equally useful and offer the same great performance we have come to know and love from Noctua. As far as the accessories go, they all perform as good as one could hope for. My Favourite was probably the fan controller as it allowed me to control my 2 front intake fans and 1 exhaust fan with ease. During the day I like them silent, but when the headphones come out and the game comes on, it’s time to turn the fans up a bit and this was done easily and quickly. The Anti-vibration mounts are nice as well. Not only do they reduce noise from vibrations, they allow you to install and remove your fans with ease which is always a plus when it comes time to clean them. 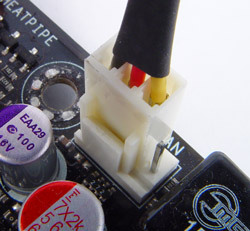 Lastly, the 4-pin PWM to SATA power cable is a great addition to any build as it will allow you to connect a fan to any extra SATA power cables you have coming from your power supply. Those with motherboards that don’t have a lot of fan headers and are not keen on using a controller will find these very useful. Another issue that I ran into is the fact that these fans are so incredibly quiet that I was not able to pick them up with my dB meter. The ambient noise in my condo is above that of the fans, and the only one I can audibly hear over anything else any more than a foot away is the 120 mm fan. At 70% speed (thanks again for the awesome tool, Noctua! ), I was only able to hear it at the same distance as the other fans. It becomes audible above 70%, but not intrusively. I have an absolutely maddening obsession when it comes to rig silence, so for me to say this, it tells you something. Even the 40 mm fans did me very proud indeed. I was able to hear them a very small amount, but given that they are spinning at 5000 RPM (I may or may not have tried to stick my finger in to slow it down…), it blew me away with its noise level. Simply phenomenal acoustic levels. Can Noctua fans be used to replace noisy stock fans in NAS devices? Can Noctua fans be used to replace noisy stock fans in switches, routers or other network devices? Different pin assignment: Whereas Noctua fans use the standardised pin assignment for PC fans (see this FAQ for details), some NAS units use different assignments. For example, some devices have the power and GND or rpm and PWM pins swapped. Therefore please carefully verify that your NAS device uses the same pin assignment as standard fans. Experienced users may also change the pin assignment by cutting and resoldering the fan cables, but please note that this will void your Noctua manufacturer’s warranty. Different pin functions: Noctua fans use the standardised pin functions for PC fans (see this FAQ for details); however, some NAS units use fans where certain pins serve a different function. For example, some devices use the RPM pin for “power good” signals. Therefore please carefully verify that your NAS device uses the same pin functions. Firmware speed control: Some NAS devices demand a certain maximum or minimum fan speed. If the new fan doesn’t have the same or similar maximum or minimum speed, the device may display errors or even shut down. Different starting voltage: Most NAS devices use voltage-based speed control. If the new fan has a higher starting voltage than the original fan, it may not start up right away. This may lead the NAS device to display errors or even shut down because it suspects a fan failure. Different power draw: Some NAS devices monitor the fan’s power draw. If the new fan has a lower power consumption than the stock fan, the device might display errors or even shut down. Please note that most NAS manufacturers don’t provide detailed documentation regarding fan compatibility and control, so users who want to replace the fans of their devices usually have to rely on “How to” guides, blog and forum posts or video tutorials. For example, there are excellent video tutorials available for changing the fans in popular Synology NAS models (DS416j, DS1515+ and DS1812+ in English, DS416/DS415/DS916/DS216/DS214 and DS1515+ in German). Please also note that fan compatibility and control can vary from model to model and even from revision to revision even if the devices stem from the same manufacturer. As a result, it is important to make sure that the information or guidelines you rely on when replacing your NAS fan are applicable to your specific model as well as your specific hardware and firmware revision. Due to the possible issues listed above, Noctua recommends that only experienced users attempt to replace their NAS fans. Please note that since there are so many different NAS models and most of them lack documentation for aspects such as fan compatibility and control, Noctua customer support cannot assist you with compatibility issues when replacing NAS fans. Please contact your NAS manufacturer for any questions regarding aspects such as the device’s pin alignment or fan monitoring and control. Different pin assignment: Whereas Noctua fans use the standardised pin assignment for PC fans (see this FAQ for details), some network devices use different assignments. For example, some devices have the power and GND or rpm and PWM pins swapped. Therefore please carefully verify that your device uses the same pin assignment as standard fans. Experienced users may also change the pin assignment by cutting and resoldering the fan cables, but please note that this will void your Noctua manufacturer’s warranty. 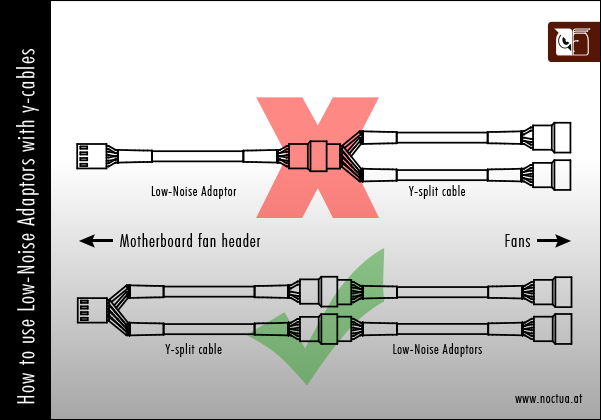 Different pin functions: Noctua fans use the standardised pin functions for PC fans (see this FAQ for details); however, some network devices use fans where certain pins serve a different function. 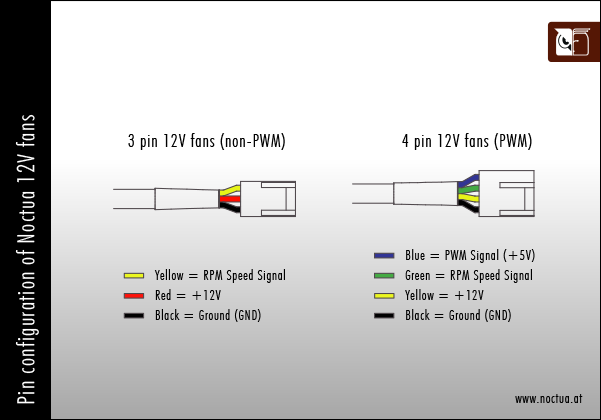 For example, some devices use the RPM pin for “power good” signals. Therefore please carefully verify that your device uses the same pin functions. Firmware speed control: Some network devices demand a certain maximum or minimum fan speed. If the new fan doesn’t have the same or similar maximum or minimum speed, the device may display errors or even shut down. Different starting voltage: Most network devices use voltage-based speed control. If the new fan has a higher starting voltage than the original fan, it may not start up right away. This may lead the device to display errors or even shut down because it suspects a fan failure. Different power draw: Some network devices monitor the fan’s power draw. If the new fan has a lower power consumption than the stock fan, the device might display errors or even shut down. Please note that most network device manufacturers don’t provide detailed documentation regarding fan compatibility and control, so users who want to replace the fans of their devices usually have to rely on “How to” guides, blog and forum posts or video tutorials. Please also note that fan compatibility and control can vary from model to model and even from revision to revision even if the devices stem from the same manufacturer. As a result, it is important to make sure that the information or guidelines you rely on when replacing your fans are applicable to your specific model as well as your specific hardware and firmware revision. Due to the possible issues listed above, Noctua recommends that only experienced users attempt to replace their pre-installed fans in network devices. Please note that since there are so many different devices and most of them lack documentation for aspects such as fan compatibility and control, Noctua customer support cannot assist you with compatibility issues when replacing pre-installed fans. Please contact your network device manufacturer for any questions regarding aspects such as the device’s pin alignment or fan monitoring and control.